Abandoned and derelict vessels are a problem for many U.S. harbors, bays, and shorelines. 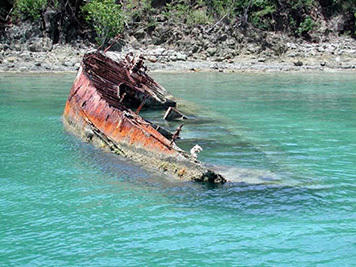 Sunken, stranded, and decrepit vessels can be an eyesore and become hazards to navigation. At the same time, these vessels can pose significant threats to natural resources. They can physically destroy sensitive marine and coastal habitats, sink or move during coastal storms, disperse oil and toxic chemicals still on board, become a source of marine debris, and spread derelict nets and fishing gear that entangle and endanger marine life. Research to address abandoned vessel issues, including legal obstacles. Working with the National Response Team to document removal efforts and related best practices. Producing guidance materials for state, territorial, and local governments. 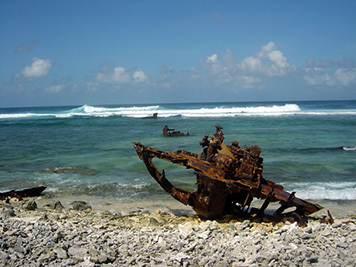 Developing databases of information on potentially polluting shipwrecks and abandoned vessels. By documenting case histories and developing a national perspective on the problem, NOAA has been able to share successful policies and approaches for dealing with abandoned and derelict vessels. Over the past decade, OR&R prioritized our limited funding to assist with vessel removals. We focused our activities on coral habitats in both the Pacific and Caribbean, where we performed surveys in Guam, the Commonwealth of the Northern Mariana Islands, American Samoa, Puerto Rico, and the U.S. Virgin Islands. OR&R is strengthening partnerships both within and outside of NOAA to address this issue. In 2009, NOAA held an Abandoned and Derelict Vessel Workshop for federal agencies and state managers, allowing them to identify common issues and share potential solutions. OR&R is currently talking with states about how we can better support them on this important, common, and often costly issue. The NOAA Marine Debris Program has been working with state and local partners to help consolidate information which is available from the newly launched Abandoned and Derelict Vessel (ADV) InfoHub. This resource provides a central source of information regarding ADVs and the policies surrounding them. Users can access information for each coastal state, including details on legislation, funding, and information about available state ADV programs, as well as links to relevant publications, case studies, and legal reviews. This resource also provides information for the appropriate state agency to contact regarding abandoned vessels. the roles and responsibilities of each agency in accordance with those authorities. Read the report on authorities and best practices. 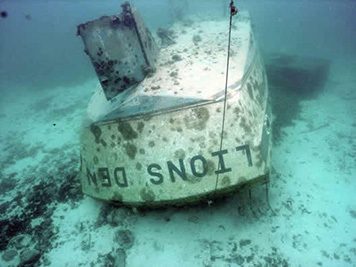 In addition to the challenge of abandoned and derelict vessels, NOAA is also conducting a risk assessment and prioritization of sunken wrecks in U.S. waters. NOAA maintains a large database of shipwrecks, dump sites, navigational obstructions, underwater archaeological sites, and other underwater cultural resources. The Resources and Undersea Threats database includes approximately 20,000 shipwrecks in U.S. waters. In 2010, Congress tasked NOAA with identifying those potentially polluting shipwrecks in U.S. waters that would cause the greatest ecological and economical impacts. This project supports the U.S. Coast Guard and the Regional Response Teams as well as NOAA in prioritizing threats to coastal resources. At the same time, it helps establish the historical and anthropological significance of these nonrenewable cultural resources. This work is part of NOAA's Remediation of Underwater Legacy Environmental Threats (RULET) project. NOAA scientists and archaeologists searched a broad variety of historical sources on wrecks in U.S. waters. Analyzing this data allowed them to develop a priority list of wrecks for further assessment. They worked closely with the U.S. Coast Guard Salvage Engineering Response Team to corroborate the historical information gathered by NOAA with the salvage engineer perspective. In addition, NOAA worked with the private consulting firms Research Planning, Inc.; RPS ASA; and Environmental Research Consulting to assess the ecological and socio-economic resources at risk and conduct modeling of potential oil spills from the priority wrecks. On May 20, 2013, NOAA released both an overall report describing this work as well as recommendations and 87 individual wreck assessments. The individual risk assessments highlight not only concerns about potential ecological and socio-economic impacts, but they also characterize most of the vessels as being historically significant. Read the national report and the 87 risk assessments: Potentially Polluting Wrecks in U.S. Waters. NOAA Report Identifies Shipwrecks with the Potential to Pollute: Read the story behind the 2013 NOAA report identifying shipwrecks that could be leaking oil. Photo Gallery: View a collection of photos highlighting some examples of the wrecked and abandoned ships dotting U.S. waters. Abandoned Vessels as Marine Debris: Learn about the NOAA Marine Debris Program's efforts to deal with the abandoned and derelict vessels littering ports, waterways and estuaries all over the country.